Today I played with steel wire and started on a necklace. My fingers hurt from all the twisting, and bending and hammering I have done today! It is no easy feat, this wire work! I am not done with this necklace yet, but it is a good start. I will try and finish it tomorrow when my fingers are less tender! But for now, here is a picture of my WIP (Work in Progress). 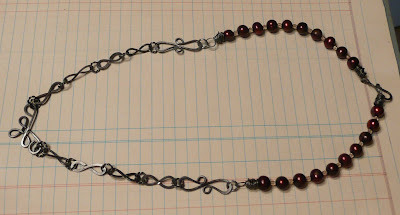 It has red pearls, steel wire, and peach color glass beads so far. I have a special focal piece I am working on so stay tuned. It's a lovely start. Can't wait to see how it evolves. I've done a little bit of wire work so I know how hard it is to make all those loops. great work! !